Central Florida Last Minute Gift Idea! What do you get someone who has everything they need? How about an eagle, osprey or even an owl? At the Florida Audubon Birds of Prey Center in Maitland there are many birds just waiting for a family to adopt them. Click on their website link and start shopping for that perfect bird gift. Then, plan a trip to Thurston House Central Florida B&B to visit your bird. We are just a short stroll away! It seems fitting to have this Buzza Company print hanging in my B&B office. 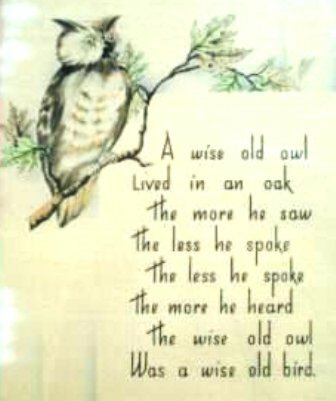 Of late we have been entertained a lot by the local birds, specifically the owls. 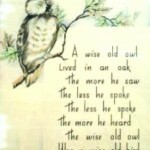 One in particular seems to love to swoop and hoot. We have named him Cyrus, in honor of the original owner of this magnificiant 1885 Queen Anne Victorian Central Florida home, Cyrus Brooks Thurston. Just two streets away from us is the Audubon Center for Birds of Prey. A short stroll will get you to their gate. Step inside and experience the wonder of these creatures. 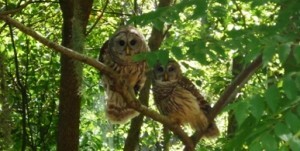 The center is not only home to many owls, but also to eagles, hawks, vultures, osprey, and more! You can even adopt a bird in honor of a loved one, a unique and thoughtful gift! Of course you can just sit on our porch rocking away and let them come to you. We call it our guest entertainment. 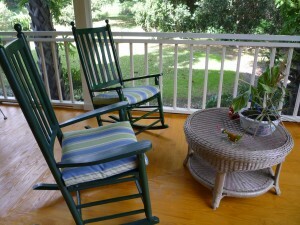 Come see, at Thurston House, our Central Florida bed & breakfast! 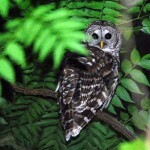 The Audubon Center for Birds of Prey in Central Florida is just minutes away from our North Orlando bed & breakfast. Founded in 1979 in Maitland, FL, the Audubon Center for Birds of Prey has treated over 12,000 injured or orphaned birds of prey (raptors), releasing more than 40% of these former patients back into the wild. The Center handles the largest volume of eagles, owls, falcons, hawks, and kites east of the Mississippi River–averaging more than 650 admissions, or injured or orphaned birds of prey, each year—and is a leader among all North American rehabilitation centers for specialized eagle care. Of course, sitting on our Maitland Winter Park b&b porch or strolling our grounds can feel like a birds of prey center too. 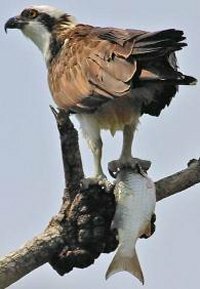 We often see osprey fishing in the lake, or hear the hoots of owls. Sometimes the owls even allow their photo to be taken, as was the case this past weekend. The Great Florida Birding Trail! What is the Great Florida Birding Trail? The Great Florida Birding Trail is a program of the Florida Fish and Wildlife Conservation Commission, supported in part by the Florida Department of Transportation and the Wildlife Foundation of Florida. This 2,000-mile, self-guided highway trail unifies nearly 500 birding sites throughout Florida. Modeled after the successful Great Texas Coastal Birding Trail, this ambitious project features detailed guide booklets and special highway signs identifying Birding Trail sites. Free guide booklets contain site descriptions, directions, and maps showcasing the wonderful birding opportunities in Florida. Each Birding Trail section consists of a series of clusters, with each cluster containing 1 to 15 sites highlighting communities and special ecosystems like the Lake Wales Ridge. The Audubon Center for Birds of Prey is two streets from Thurston House B&B in Maitland, and an amazing facility! They even hold baby owl showers yearly. Come see! Baby Owl Shower Invitation to All!!! 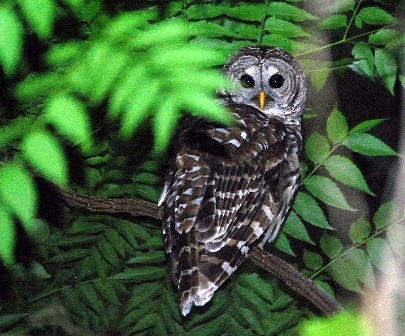 Each Spring the Center holds its annual Baby Owl Shower to raise funds to offset the increased costs during baby season. Join us on May 8th to celebrate Mother’s Day and spring. Non-releasable baby raptors will be available to view (pending). Other organizations will be joining us this day for educational activities and programs. Admission is “free” that day with baby gifts from our wish list that is used in caring for these young raptors. Contact the Center at 407-644-0190 for more details or if you have questions. Spring is coming and with it brings baby bird season. During “baby season,” as the Center calls it, the clinic receives approximately 20% of our annual patient load. Most of these young birds have been temporarily displaced from their nests. The Center’s ultimate goal is to get all these babies back into the wild where they belong, and we need your help! Many of these babies will be reunited with their families or placed in foster nests. Others that are orphaned or that cannot be returned with their families are being raised and prepared for life in the wild. Center staff spends many hours educating the public on what to do if they find a baby bird and if the bird is in need of help. The best procedure is to get the baby back up into the nest with its parents if at all possible. FOOD…287 pounds of fish, 148 quail, 595 chicks, 679 mice, 93 rats, 5000 crickets and 4000 mealworms. We went through 2 knives and three pairs of scissors cutting it all up into baby-size portions! HYDRATION…12,000ml of fluids were administered. CLEAN-UP…we washed 956 baby blankets and used 150 pounds of newspaper. LABOR…500+ volunteer hours were donated to rescue, feed, clean cages and care for the babies. This fabulous center is just a short walk from Thurston House Bed & Breakfast. Bring a baby owl gift for free admission.